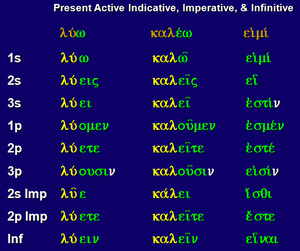 Impersonal dative constructions using datives are being looked at again here, and the key to understanding is that temporary states tend to be impersonal dative constructions, more permanent ones are personal with the person who is in the state being the subject of the verb. I am often asked (or, for hypersticklers, ‘it is often being asked unto me’) “Is the Goldlist only for vocabulary or is it also for grammar, and other things?”. There are sometimes cases to be made for doing multiple goldlists around a single language. If we are talking about, for instance, and understanding of the grammar points in Japanese or Chinese, it may be easier for some people to deal with these and get them out of the way in PinYin or Roomaji (there are pluses and minuses to that approach, as hiragana is used in Japanese for most of what would be considered grammar, and getting used to the look of that grammar in hiragana is essential, but you can get to it later once you’ve grasped what’s actually going on using Roomaji) A separate goldlist book can be used for that, and that would enable a person to use their main goldlist to keep track of pure vocabulary as it grows. Likewise phrases, proverbs, lines of songs in the language that you want to remember – if you don’t want them getting in the way of the pure vocab count, stick them in a separate goldlist. It doesn’t bother me much in my case, I know anyway what the composition of a given headlist is and where I got the material to be memorised from. Whether you have a separate grammar Goldlist or a mixed one, when it comes to grammar and the goldlist there are certain things which need to be borne in mind. – In most languages it is possible to talk about regular grammar, the basic rules, regular verb conjugations, noun declensions, etc, and then there will be irregularities. The regular parts are learned as tables, and the use of the grammar as well as syntax is driven home by typical practice sentences. All of these things can be included as line items in the gold list once over, and not any more for those words which follow the regular paradigms. – the irregular verbs, nouns, adjectives, etc, all the words which don’t follow the tables which have been memorised as deafult tables should have their irregularities learned at the same time as you learn the word. In the headlist you might spread the word over different lines for all the parts in which it is irregular, and then combine them in later distillations or leave them out once you remember them. If you are talking about Spanish, for instance, (a language whose nouns are strightforward in the main but the verbs can be a nightmare) it is possible to determine from three or four of the “persons” of a verb in any declension how the other positions will look. Therefore even in the Headlist when looking at the present definite of an irregular verb, it will show only four rather than six positions. If you prefer to write all six in H (notation for the Headlist) just to get a better feel for them, then that’s up to you. If you do that, it will be possible to take the verb to four lines in D1 (notation for first distillation) and in D2 you might get those four verb forms all on one line, writing the part of the root that doesn’t change, a concatenation mark and then the parts of the verb which change with commas after them. If you are aware that you are writing the yo, el, nosostros and ellos part of the verb each time, then you don’t need to add those pronouns. By D2 you’ve probably droppoed the infinitive anyway, so as you see the rate of distillation of grammar done that way is faster than for normal vocab. After D2 you’ll probably be unable to do any more compaction, so dropping lines is a function of already being comfortable with all the irregularities. If we were doing Japanese verbs, the Goldlist for them would look quite different. On almost all verbs it would be possible to get to one line quite quickly. The exceptions here are things like modestive verbs and aspects like the potentive form of suru is dekimasu. Most other unusual aspects can be derived from the rules by which connexive forms are made from different stems of the basic form, and that rule can be condensed to fit on one line anyway, plus general rules about phonology that you learned when you did the katakana tables and hiragana tables anyway. It’s no surprise that ‘matsu’ becomes ‘machimasu’, that isn’t even an irregularity, but I can envisage a person wanting to include it in H anyway just by way of getting used to it. Tables of the regular paradigms can be included in the Goldlist. Some of my Czech goldlist contains pure tables and the numbering at the side is broken so as to include the number of lines in the tables, but sometimes the tables can be manipulated and this actually aids learning. For instance the adjective endings table includes at one stage of distillation M, F, N and the two plurals going across the top and seven cases going down – that’s a seven line deep table. One trick for further compaction, possible only if you are just looking at the endings and not the stem, is to turn the table on its pivot and have it presented in the less usual way of M F N Pl (with the masc animate and the others separate using “/” signs just for the nominative and accusative where they differ going down and the seven cases going across. That turns a 7 liner into a 4 liner. In these cases I skip a line number where the table headers are. Sometimes it’s also nice to use colours on the grammar tables to highlight areas which are identical. I haven’t yet learned a language whose grammar would be the biggest task. I can’t think of any language, even Spanish with its irregular verbs taken at a very gradual pace, where the grammar has been the big deal. In a challenge to gain a 15,000 word vocabulary and all the grammar, the Goldlist parts needed to learn pure grammar will be something between 5 and 15% of the total. I hope this has been useful, and either clears up people’s questions about the use of Goldlist for grammar, or corroborates what they do naturally with the Goldlist or gives them some new ideas. Newsflash: Soon I will start a new goldlist for Indonesian and this time it’s my intention to use it as a model goldlist that will illustrate the forthcoming book. I am going to start off by doing the Pimsleur before I even look at a written word, therefore dealing with the first issue of phonics, intonation and accent which is in my view the weakest area of the Goldlist method. I will then do a particularly careful Goldlist which will be linked to the TY book, and therefore anyone wishing to follow the whole logic can get hold of the same materials, and see if they like how their application of the method differs from mine. Which doesn’t mean mine is necessarily better, but we can all compare notes that way. If anyone is interested in joining in that project, please let me know. 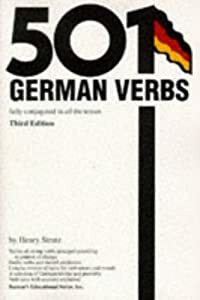 Strutz's funky stuff: the cover of "501 German Verbs"
I am only now coming to answer a query that has been waiting for eight weeks, as things are so busy at work. The following letter came to me on YouTube on 2nd May from Mr K.M. Hello sir, (Apologies, I truly don’t know how I should address you (Mr. Huliganov, Uncle Davey) anyway, I must firstly say that I greatly admire you as a person and am so happy that I discovered you. Quite a while ago, you were nice enough to translate a video in Russian for me (just a note for later: I’m not learning Russian) which I greatly appreciated. Now I come to you seeking more serious help with something. Language learning with the Goldlist system. The problems I’m having with getting started with the Goldlist system are directly related to organizational matters. Now, just what do I mean by that? Well, I feel that it might be prudent to learn words through variety but with some type of organization (nouns, verbs, prepositions…) Is this even necessary? I’m sorry if I haven’t seen a video or read an article or blog about what I’m asking. Do you think I should just go through my dictionary to pick words and leave it at that? Overall, how should I easily select and organize words? I’m dead serious about learning with the Goldlist system, it’s just those first few steps that are the hardest. Getting started. Really getting into it. I sincerely thank you for your time. Perhaps you could tell me what languages you know, what you are learning and what your objectives and targets for this language are. Then also some words on what your materials are that you have chosen in order to learn it. That way, I’ll be able to explain how to get the most from my memory method in those circumstances. Well, I am a fluent English speaker, and I’m learning Deutsch. Just for the sake of telling you more about myself as as a person, as you and I most definitely share a love for languages (me on a much less professional and scholarly level than you however 🙂 ), I have learned a fair amount about other languages (what group which language belongs to, the overall sound of it as a language, as well as multiple aspects of the grammar etc…) But anyways, I am most serious about learning Deutsch. My family is from Deutschland, and most of my family still lives there, so I’ve been going my whole life to visit family etc. After much time and thought, I am now seriously considering moving to Deutschland. You may now be wondering, why don’t I already know Deutsch? Well the reasons are simple, My father has traveled quite frequently throughout my childhood for work, allowing less time for him to teach me, and my mother comes from a Scottish family. Luckily, my father travels less now, which gives he and I more time to practice pronunciation (which I am good at because of the fact that I’ve been listening to it my whole life). That’s the main thing I’ve been practising with him, reading, and allowing him to correct me. And more recently, both of us taking turns reading the passage(s), and he, on his turn, translating. So he is certainly a good resource that I have for which I am incredibly thankful. However, (and I’m of course sure you’ll understand) I do not regard him as a resource that is consistently dependable and overall best for myself. Please do not however think that I want to completely dismiss him as a resource. I’d just like to learn on my own as much as I can for independency-related reasons (I’m sure you know what I mean). I still will always ask him a question, etc. I also have various Deutsch books spanning many genres such as poetry, history and classic literature (Herman Hesse etc.) just lying around the house which I can use. Unfortunately, I didn’t have a great deal of time, but quite rightly Mr K.M. reminded me that I had promised an answer and so here we are with the best answer I can give to this worthy query. The question is not entirely dissimilar to some things asked by Cheryl in the video which you can find by searching on “Cheryl” within this blog. However, what I will do is add to this and give a full strategy for learning German from English at the position you appear to be now. I would make the assumption that your German grammar could do with a refresh from the start so I would work through the Donaldson book and goldlist that. You might kick off before everything else by just working through the Michel Thomas audio course – it won’t take long and some things will be plainer to you after working through that and for that you don’t yet need to put pen to paper. In my opinion you don’t need to goldlist all the verbs book or even start goldlisting the dictionary. Just go through the Donaldson book and then try some literature. You can either use google translate for a quick translate or better still buy or download an English translation of the literature. You mention you have Hesse lying around. Well, Siddartha and a few other novels by Hermann Hesse in English is available as a free of charge epub on feedbooks if you have an Android phone with the Aldiko bookreader. You can save dictionary time, which is boring, by using the translation. d) read again the German original, understanding it fully now that the words are in place. Always seek foremost to enjoy the original literature, don’t treat it as a memorizing exercise or it will cease to be one. Seek to admire the use of language by the author, and be enriched by it. – for verbs, where they are separable or not, whether they are declined weak or strong and what the past tense and participle are if strong, as well as any umlauting in the second and third persons singular of the present tense. This is where your verb book comes in. – for prepositions, what case they are governing in the sentence and why. g) afterwards, progress the headlist as normal, which means to distill it at the most frequent after a two week break. h) whenever you wish to have more fluency and “activate” the German, either go to Germany or have German speakers nearby so that you wake up and activate all your German in just three days. Resist the temptation to judge your progress by how conversationally fluent you feel. That’s about degree of activation, not depth of knowledge.